The art of Aibukan Budo is a study in martial arts of the Aibukan (harmony martial arts training place or house). The key word is ‘study,’ because our practice is directed toward a study of coordinating the mind, body, and spirit (intent). Aibukan Budo is not just a practice of physical movement alone. That type of practice would seemingly be pointless because the practitioner would not gain the depth of understanding needed to be proficient. Aibukan Budo is an evolutionary development by our Founder Tom Snowden Sensei, based on continuous practice and study since 1966. This practice has been of the classical/traditional martial arts of Japan, Okinawa, and China (Taiwan). Aibukan Budo embraces the specific systems of Aikido (Yoshinkan, Jiyushikan, Tomiki-Ryu), Judo (Kodokan), Jujutsu (Yoshin-Kai) Okinawa Goju-Ryu Karate-do, Hsing-I; Pa Kua; Tai Chi from China Hand, Kenjutsu, Jodo, Bojutsu, Tantojutsu and Taihojutsu (Police controls). 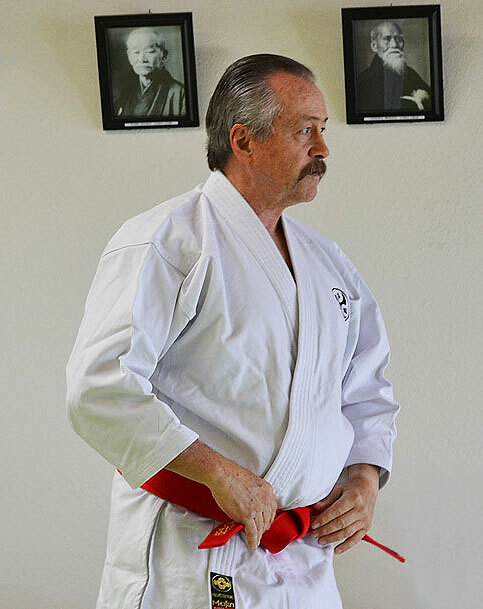 Snowden Sensei has had continuous practice and study of these arts, generally advancing to the grade of 4th Dan (degree black belt) instructor level or above. At the time of his passing, Snowden Sensei was a 9th Dan of Aibukan Budo, awarded by the Aibukan Yudansha-Kai (Aibukan Black Belt council) and S.A.Y.A. San Diego Associated Yudansha Alliance. One of the concepts of Aibukan Budo is that it is meant to be a family system where every member of the Aibukan Dojo is considered to be part of the family. As such, every member is expected to practice with the utmost diligence so they can accept the responsibility of ensuring that Aibukan Budo is passed on to benefit others. In essence, proper martial arts study of Aibukan Budo incorporates a built-in mentoring system where Sempai (senior students) are responsible to mentor Kohai (junior students). This process is mutually beneficial so both Sempai and Kohai can get the most out of their study. A sense of development and independence to be able to stand on ones own merit is nurtured from the start of studying Aibukan Budo. The main projection of Aibukan Budo is a concept of Shin-Jin Aibudo (thinking man’s harmony martial art way). This means that the best use of energy and body mechanics should be used. In other words, one should work smarter not harder. When accomplishing technique, this by no means is to be confused with any less ability to dispense a sense of forceful power. Instead, it is an optimum goal of our practice to have more absolute control of dispersing power if needed, in a wide range of control throughout the application of our technique. The idea of this control can give the person doing a technique many more options throughout a given situation. Another aspect of this is that the one who is more able to change or transition in a conflict is likely to be the one with the advantage. Aibukan Budo is a practice and study of conflict resolution, combative arts, tactics, and situations. As such Aibukan Budo is in a constant state of evolution. Combat and conflict by nature is a constant state of evolving change. Therefore this study must change and evolve or it will become ineffective. With this concept one begins the study of Aibukan Budo but there is really no end to the practice. One continues the practice striving to get better and better. This is accomplished by using the formula of imitating action, then learning and knowing and finally perfecting what is learned. At the same time a sincere understanding is acquired that perfection may never really be possible, rather one may only evolve to get better and better. This idea is another concept of true martial arts study. One should always consider themselves a student no matter what their level of experience because that way they can continue to grow in their ability to change. The reason we strive for continuous practice is to gain adaptability and the ability to change. In a confrontation, the one who is most adaptable to the change of the situation, will more than likely have the advantage to overcome that conflict. Another primary aspect of development in Aibukan Budo is the total development of the person. That is, so one may be independent and adaptable enough to resolve the many conflicts of life. Those conflicts may be in the physical sense of self-defense or in the aspects of everyday life. Aibukan Budo adheres to the principles involving use of force both from a legal and moral level. One should use force only when it is reasonable and necessary for the circumstances. Aibukan Budo promotes the aspect of practitioner being able to deal with an attack in one of the three ways depending on the circumstances. The first is being able to evade or avoid an attack/conflict. The second is to control the situation through a wide range of options provided in Aibukan Budo. The third is to stop a threat of great bodily injury or deadly force against ones self or others, with means necessary for that situation. When the student studies Aibukan Budo they will learn methods of mental as well as physical ways of dealing with conflict. All things can be related to a matter of tactical approach. If we use good tactics with sound principles, we should be able to remain in control of our own destiny. Verbalization and how one speaks in an adverse situation can be just as important as proficiency in physical technique. Students of Aibukan Budo learn the ability of change from the following practice and understanding of: anatomy, physiology, body mechanics, throwing techniques, joint locks, pressure points, chokes, ground fighting, striking with personal body weapons (hands, feet, knees, elbows), an understanding of classical stick (Jodo and Bojutsu), sword (Iai/Ken Jutsu), and contemporary weapon use/disarming technique. In addition, the study of effective technique is obtained through the understanding of principles such as; fighting distance interaction, Mechanical Advantage Positioning, Science of Lines, Angles and Circles, Action, Reaction, and Counter Action, Initiative of Reactive, Simultaneous, Pre-emptive, and Timing Integration.